Belding Elementary kindergarten teacher Leon Schrauben uses balanced literacy, an approach that aims to give children a variety of rich language experiences while they learn reading skills and letter sounds. 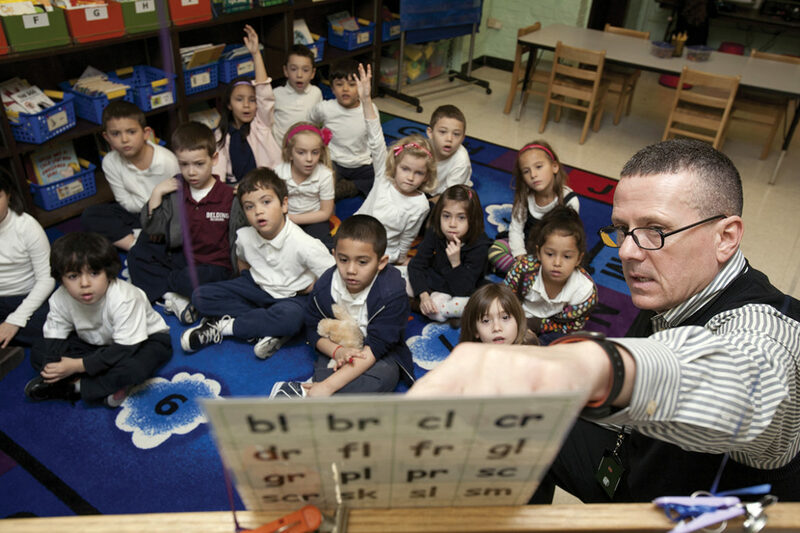 In fall 2007, CPS took a step aimed at bringing more consistency to reading instruction across the district by launching an initiative to get schools to adopt one of a number of selected reading curricula. Now he incorporates a wide range of whole-class, small group and individual activities. During one day’s reading workshop, some children are doing literacy activities on their own at different centers in the classroom. Schrauben picks out other groups of students for specific instruction on letter sounds and reading books at carefully chosen levels. “I want to know why you keep saying ‘a,’” Hamilton says to a boy who reads “fat” as “fate”. “Sound it out,” she says. The boy starts to do so. Hamilton interrupts. Stories are about deepening comprehension and dealing with complexity – exactly what the reading standards are about. Stories are a powerful tool for composing well-crafted arguments, and often they are excellent conveyers of the complex evidence needed to substantiate a writer’s claims. Chicago has long been seen as a leader in education reform, and the apparent progress here even helped elevate Arne Duncan from district CEO to U.S. Secretary of Education.But a study released today by the Consortium on Chicago School Research claims there’s been no significant improvement in the key area of elementary school reading, and that the racial achievement gap has worsened over the past two decades since the advent of the first phase of school reform.